Reserve this “Jetsons” worthy Router now. LG Electronics has acquired HP’s WebOS for an undisclosed amount. 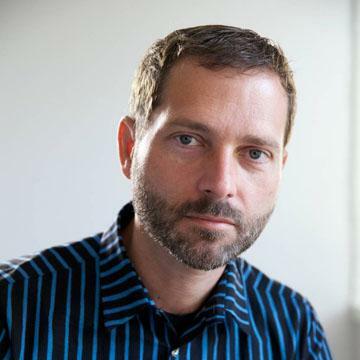 When last it changed hands WebOS was part of Palm which was purchased for $1.2 billion in 2010. The International Federation of the Phonographic Industry (IFPI) reported that global digital revenues were $5.6 billion in 2012. This represented about 9% growth from 2011 and accounted for 34% of total industry revenues. Apple regularly reports iTunes as a separate revenue item and occasionally it also reports payments data for developers and app download rates. 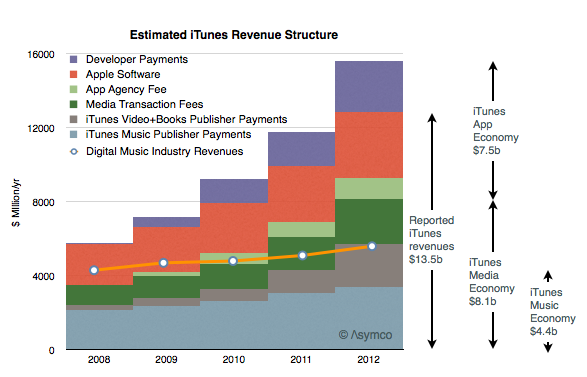 By interpolating the data published and combining it with some assumptions it’s possible to estimate the mix of revenues (and costs) associated with iTunes. My yearly estimates are summarized below. On the disruption of console video games and the signals sent by Google with their very own Chromebook. via 5by5 | The Critical Path #74: Pixelated. You can see the original description and download links here. 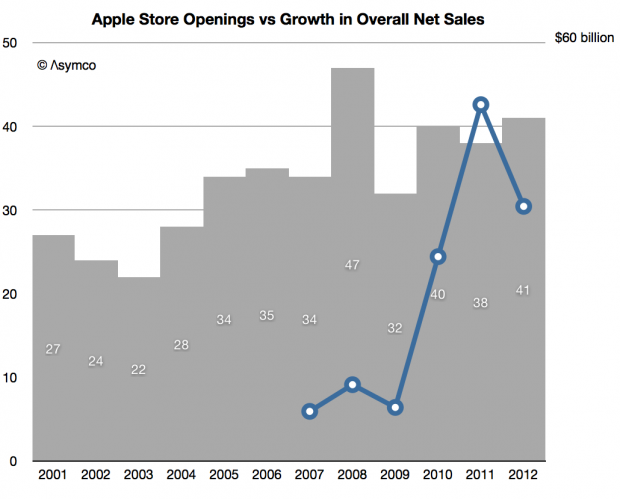 In 2012 Apple opened 41 stores. The total is the second highest yearly opening rate since the stores first began operating. The highest total was in 2008 when 47 stores opened. Although it is a healthy total, the surprising story about retail is that stores are not being opened as quickly as Apple’s sales and reach are growing. The following graph shows the yearly opening rate. The line in the graph above shows the change net sales since 2006 (right scale). The store opening rate has been around 40/yr. during the last five years, up from 30/yr. during first seven but a 33% growth rate it’s still a frustratingly slow rate of growth. Consider that during 2007 when Apple opened 34 stores, Apple’s net sales were growing at the rate of $7 billion/yr and that in 2012 when it opened 41 stores sales grew about $37 billion or more than 5 times faster. It’s a curious choice given that companies which have “crossed-over” from being service or software oriented to hardware have started with more “mobile” devices. 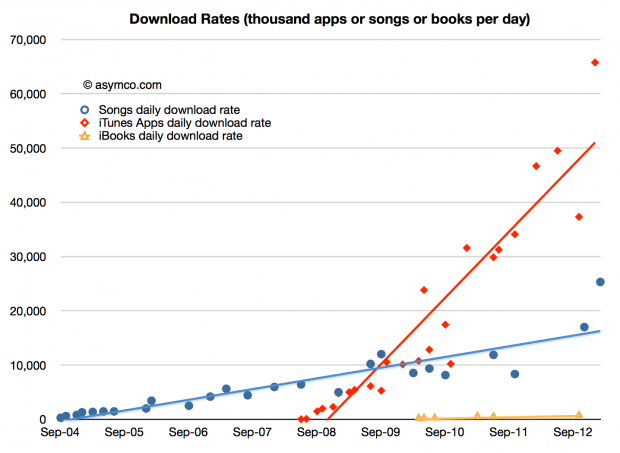 Amazon launched the Kindle as a low-end product and gradually moved it up-market. Microsoft launched with the Surface tablet and then followed with the Pro version as a hybrid laptop/tablet. It’s also curious since Google has spent years contributing to the development of mobile phones and tablets under the Nexus sub-brand. This was an approach consistent with earlier Chromebooks as well. But the Pixel is a high-end product. It’s priced at the top of the range of what a laptop computer might cost (given the dimensions). Perhaps it’s part of a pattern where Google will hone its hardware skills toward releasing a phone or tablet it can call its own. Starting with a more traditional computer is “easier” than trying to deliver on the more demanding smaller form factors. And yet, the more obvious question is why would Google want to be in the hardware business? Isn’t being a web-focused company implicitly suggesting that hardware is a commodity to be farmed off to perpetually impoverished and violently abused OEMs? The truth is quite different from this. 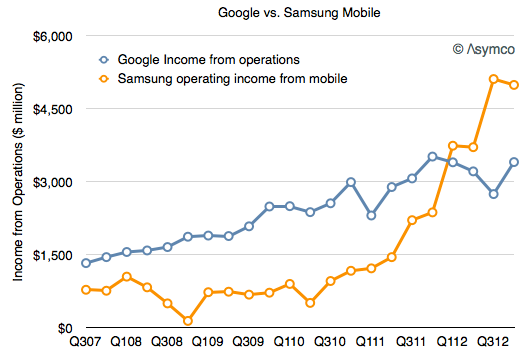 Samsung currently makes far more operating profit from Android phones than Google does from all its operations.